Amar Akbar Anthony, should be a worthy watchable comedy entertainer. The biggie combination will assure that Prithviraj, Jayasurya, Indrajith with Nadirsha, what else needed for fun unlimited…!!! History proved super hit combo, last time the trio of Prithviraj, Indrajith and Jayasurya came together, malayalam cinema was gifted with one of the highest grossing campus-based films, "Classmates". The three actors also share a great bond off-screen as well. As Mimicry artist, Actor, Playback singer, Lyricist, Composer and now debuting as Director, Nadirsha is the key point of the movie. Nadir Shah's first attempt to direct a film makes "Amar Akbar Anthony" is one of the much awaited films of the year. 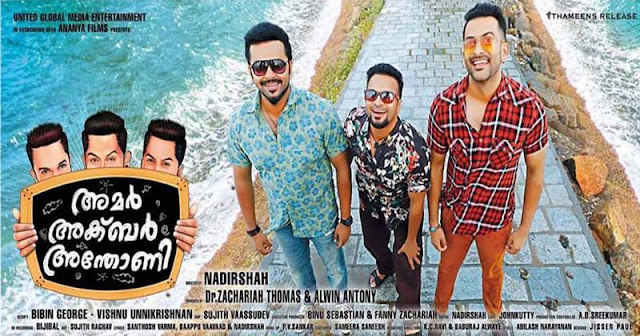 Prithviraj, Indrajith and Jayasurya have performed remarkably well in their individual comedy roles and hence the combination of the trio in a comedy thriller like "Amar Akbar Anthony" is worth a watch. But if we look back to the Prithviraj’s comedy movies, then we need to rethink several times, all the movies that screens prithvi as comedian made a box office flops. The background score was done by National Award winner Bijibal. The music is composed by director Nadhirshah, while the lyrics are written by Santhosh Varma, Bappu Vavaad and Nadhirshah. The first song, "Premamennal", which is sung by Prithviraj, Indrajith, Jayasurya and Kalabhavan Shajon, has already become a fan favourite. So that’s all about "Amar Akbar Anthony" expectations, and now we need to see that whether "Amar Akbar Anthony" can repeat the success of "Classmates" in Kerala box office….?? A film with a wafer thin storyline, the primary intention of the movie is just time pass for the audience without too much digging into the storyline. If you are ready to accept this fact, then you can definitely enjoy the movie as the presence of three major stars of the younger generation with equal prominence makes their presence felt through their own style. Amar, Akbar and Anthony are thick friends and the film portray minor incidents in their life in a light hearted manner creating laughs at many places. The fun part overall is good and have worked very well but the unnecessary twist in the plot forcefully bringing some serious stuff into the overall scheme of things somehow didn't go well with me. The unexpected turnaround was not that predictable but in an otherwise nonserious plot, it turned out in creating a thorn in the smooth flow of an entertainer. Prithviraj, who essays Amar has improved a lot in the case of comical timing, when compared to his earlier comical flicks. Jayasurya is brilliant as Akbar, and scores with the perfect comical timing, hilarious mannerisms, and dialect. Indrajith played Anthony to near perfection and manages to outshines his co-stars with his performance. Namitha Pramod, who plays Jenny, has nothing much to do in the movie. She has managed to share a good chemistry with Prithviraj.But asusal the actress tends to overperform at certain points. KPAC Lalitha deserves a special mention for her amazing comedy timing. The rest of the star cast, including Srinda Ashab, Bindu Panicker, Kalabhavan Shajohn, Sasi Kalinga, Ramesh Pisharady, Pradeep Kottayam, Dharmajan, Priyanka etc have played their parts well. Amar Akbar Anthony has the Nadhirshah touch in each and every point. The debutant filmmaker has succeeded in bringing out the best from his actors; without losing the grip over the high-dose comical situations. The script by debutante duo Bipin George-Vishnu Unnikrishnan is brilliant when it comes to the comical elements. The movie also discusses a social issue, which doesn't appeal the audience much. But the rich comical situations and racy climax makes the movie engaging. Sujith Vasudev, the cinematographer has done a commendable job, by grasping the beauty of Kochi in to his frames. John Kutty's editing has helped in making the movie crispy till the end. Songs And Background Score Songs, which are composed by director Nadhirshah himself, are rhythmic and oozes energy. Background score is composed by National Award winner Bijibal compliments the narrative at most of the parts; but fails to appeal in certain points.